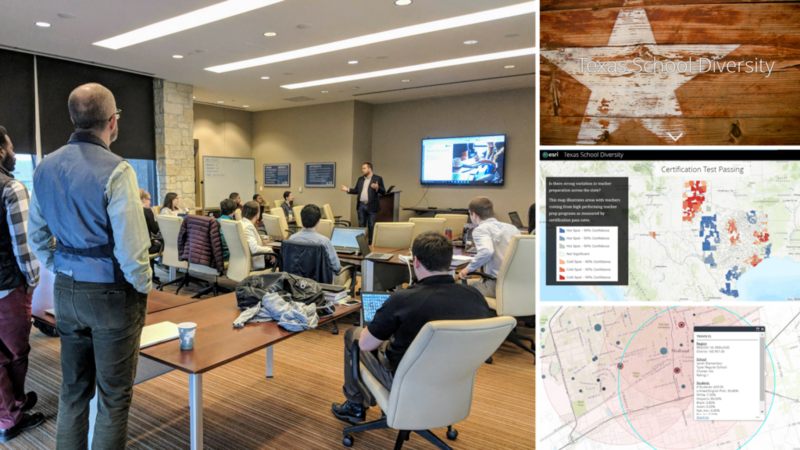 Last week, we traveled to Austin, TX to give a hands-on GIS training for the Texas Education Agency (TEA) and the American Institutes for Research (AIR). The idea behind the training was to deepen the staff’s proficiency using ArcGIS Pro/Desktop and ArcGIS Online. Here’s an inside look at the three-day training at AIR’s Austin office. Building up the TEA team’s skills with ArcGIS Desktop, and Addressing some of their current needs at the agency. Day one started well with an assessment that asked each team member to demonstrate their current proficiency with ArcGIS Desktop. This ensured each person had all of the basics down before we moved onto advanced analytics. We spent the remainder of the day diving into toolboxes including editing, data management, and spatial analytics. What is the impact of teacher tenure on student and school performance? Does a representative race/ethnic teaching population relate to student performance? What is the nature of the relationship between educator prep programs and the schools/districts they serve? Which rural districts are well-positioned to launch a grow-your-own teacher program? We closed the day by migrating everyone’s maps out of ArcGIS Pro and into ArcGIS Online. The advanced group digging into modules on grouping analysis, point density, similarity, regressions and more. The last day kicked off with presentations on building web apps and story maps. Each person then spent the afternoon creating an app that told the story of insights they discovered from their previous day of mapping. We wrapped up the training with a gallery walk of the team’s amazing creations with colleagues from TEA and AIR. Interested in starting a training?